Thoracic Injuries; Diaphragm; Thoracic Surgery; Video-Assisted Surgery. Traumatic asphyxia, or Perthe’s syndrome, is a rare clinical syndrome characterized by cervicofacial cyanosis, petechiae, subconjunctival hemorrhage, neurological symptoms, and thoracic injury. It affects both adults and children after blunt chest traumas. The diagnosis of this condition is based mainly on the specific clinical signs, which should immediately bring to mind the severity of the trauma, the various probable types of pulmonary injuries, and the need for screening and careful assessment of other organs that might also be injured. In this report, we describe the case of a 39-year-old male who developed traumatic asphyxia after severe blunt chest trauma during his work at a construction site. The patient had multiple injuries to the chest, abdomen, head and neck, which were treated conservatively. An associated diaphragmatic injury was successfully treated by video-assisted thoracic surgery. This patient is one of five patients who were admitted to Saqr Hospital in the United Arab Emirates, diagnosed with traumatic asphyxia, and treated by mechanical ventilator, supportive measures, and fiberoptic bronchoscopy, for both diagnostic and therapeutic indications, in our unit in the period between July 2006 and June 2013. As traumatic asphyxia is a systemic injury, careful assessment of the patient and looking for other injuries is mandatory. Treatment usually involves supportive measures to the affected organs, but surgical intervention may sometimes prove to be an important part of the treatment. Bronchoscopy should be performed for diagnostic and therapeutic reasons because of the associated pulmonary and possible tracheobronchial injuries. Treatment of traumatic asphyxia aims to maintain adequate tissue oxygenation and perfusion of the affected organs, and is directed towards the associated chest injuries (hemothorax, pneumothorax, fracture ribs, and pulmonary contusion) and other injuries; however, surgical intervention may be necessary. The primary concept of the management is based on the systemic nature of the insult, which needs careful assessment, and then general and specific treatments accordingly. A 39-year-old man presented to the emergency department at Saqr Hospital, UAE, with difficulty breathing, chest pain, and mental confusion after sustaining direct trauma to his thoracoabdominal region as he was stuck between two heavy solid objects for about five minutes at a construction site where he worked. Approximately 25 minutes elapsed before he was brought for medical care. On examination, the patient was confused with an initial Glasgow Coma Scale (GCS) of 14. He had rapid shallow breathing and bilateral massive subconjunctival hemorrhages [Figure 1], bluish to black discoloration of the face and bluish to red discoloration of the neck and upper chest [Figure 2]. There were bruises and surgical emphysema at the neck and upper chest but no bleeding from the nose or the ears. His vital signs were as follows: blood pressure (BP)=110/60mmHg, heart rate (HR)=108 beats/min, respiratory rate (RR)=34 breaths/min, and oxygen saturation on room air was 80%. Auscultation of the chest revealed poor air entry in lungs and scattered crepitation. Heart auscultation was normal and there were no signs of cardiac tamponade. Abdomen was soft but with tenderness in the left upper quadrant and bowel sounds were positive. 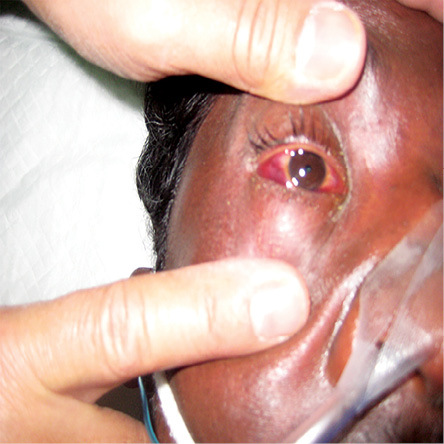 Figure 1: Patient presented after being stuck between two heavy objects for about five minutes, with subconjunctival hemorrhage in the right eye with bluish to black discoloration of the face. 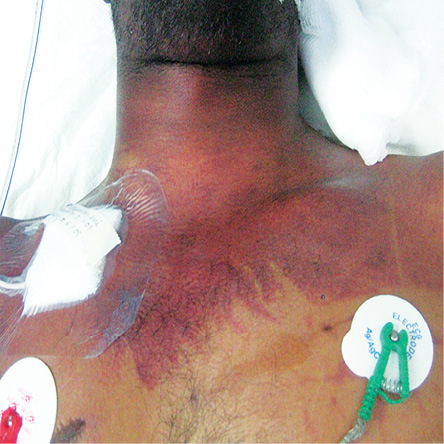 Figure 2: Bluish to red discoloration of the neck and upper chest ,with well-marked demarcation between involved area of trauma and normal tissue, could be seen in the patient. A portable cervical spine X-ray was normal. Portable chest X-ray showed bilateral hemopneumothorax and rib fractures on the left side. Two thoracostomy tubes size 32F were inserted one on each side and immediately drained 800ml of blood from the left side and 550ml from the right side. Oxygen therapy was started by nasal cannula, but the patient’s oxygen saturation did not improve. Arterial blood gases showed hypoxia (partial pressure of oxygen (PO2)=43mmHg) and hypercapnia (partial pressure of carbon dioxide (PCO2)=61mmHg) and a pH of 7.27. Thus, the patient was intubated and started on controlled mechanical ventilation at the following settings: a frequency of 18 breaths per minute, tidal volume of 800ml, positive end-expiratory pressure of 5cm H2O, and fraction of inspired oxygen of 80%. A nasogastric tube was also inserted and drained gastric juice. The patient was admitted to the intensive care unit (ICU). In the ICU, the patient was further evaluated to determine the amount of blood loss and other organs functions. An electrocardiogram and cardiac enzyme studies were assessed to exclude blunt cardiac injury (BCI). While the patient was on mechanical ventilation, the arterial blood gases improved (PO2=100mmHg, PCO2=40mmHg, bicarbonate =23.9mEq/L, oxygen saturation 99%, and pH 7.35). 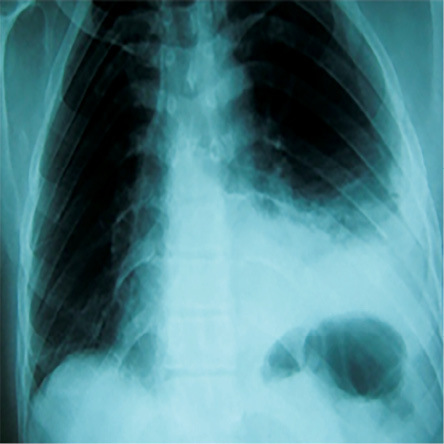 The radiological and computed tomography (CT) scan examinations of the chest confirmed the above findings in addition to bilateral pulmonary contusions. CT scan of the abdomen was normal and brain CT showed mild brain edema. While the patient was in the ICU, he developed bleeding from the endotracheal tube, which was controlled using tracheobronchial irrigation with cold saline and sodium bicarbonate as well as suctioning. We used fiberoptic bronchoscopy through the endotracheal tube to clear up the thick inspissated bloody secretion and to clarify the cause of the bleeding. The examination of the airway tree showed contused anterior wall of the trachea 2.5cm above the carina [Figure 3]. Ultrasound examination of the abdomen was normal on two follow-up assessments and neither solid organ injury nor intra-abdominal fluid collection were detectable. The patient was evaluated by an ophthalmologist and ENT specialist to rule out any related injuries. Figure 3: Bronchoscopic view showing contusion of the anterior wall of the trachea 2.5cm above the carina. The patient was weaned from the mechanical ventilator after six days, and the right-sided chest tube was removed. Repeated chest X-ray showed expanded lungs, but the left dome of the diaphragm was elevated and the costophrenic angle was blunted with retained blood in the left thoracic cavity [Figure 4]. These findings with the unexplained upper abdominal pain justified performing diagnostic left thoracoscopy, although the CT scan and ultrasound of the abdomen were normal. Figure 4: Chest X-ray showing elevation of the left dome of the diaphragm with clotted hemothorax on day six after admission and one day after weaning from the mechanical ventilator. The patient underwent left side thoracoscopy and a tear in the diaphragm was found with slight bulging of the fundus of the stomach through the tear without herniation of any abdominal viscera to the thoracic cavity apart from a small piece of omentum. Video-assisted thoracic surgery (VATS) repair of the tear was done immediately using single lung ventilation: two ports (10mm and 5mm) and 3cm utility wound were used to access the left thoracic cavity and the tear was closed with 3/0 prolene interrupted sutures. Retained clotted blood was also removed from the left thoracic cavity by frequent suctioning and irrigation. The size 32F chest tube was left in place. The patient was extubated immediately after surgery and shifted to the thoracic surgery ward. On the second post-operative day, the chest tube was removed after repeated chest X-rays showed a completely expanded left lung. The post-operative period was uneventful. The patient was discharged five days after surgery. He was followed-up in the outpatient clinic for six months and both clinical and radiological examination did not show any significant morbidity. In our patient the trauma occurred at work, whereas most published cases followed road traffic accidents.4 The characteristic physical appearance of our patient was the first thing to attract the attention towards the diagnosis of traumatic asphyxia; the importance of an accurate history, paying attention to the mechanism of trauma and a thorough systemic clinical examination are to be stressed. Traumatic asphyxia implies more systemic injuries than just a syndrome and it manifests as unforgettable, striking, and alarming specific physical signs. It could be missed in patients with multiple injuries or when the picture of the presentation is not classical and, hence, it should always be kept in mind in such patients especially when the injury involves a blunt trauma to the chest. Management includes early recognition, general supportive measures, and organ specific treatment. Bronchoscopy should be considered in any case of traumatic asphyxia for both diagnostic and therapeutic purposes. The authors declared no conflicts of interest. Written informed consent was obtained from the patient for publication of this case report and its accompanying images. Eren B, Türkmen N, Fedakar R. An unusual case of thorax compression. J Ayub Med Coll Abbottabad 2008 Jan-Mar;20(1):134-135. Khandhar SJ, Johnson SB, Calhoon JH. Overview of thoracic trauma in the United States. Thorac Surg Clin 2007 Feb;17(1):1-9. Shields MD, Thomas W, LoCicero J, Reed CE, Feins RH. General Thoracic Surgery.7th ed. Philadelphia: Lippincott Williams & Wilkins; 2009. p. 893. Sertaridou E, Papaioannou V, Kouliatsis G, Theodorou V, Pneumatikos I. Traumatic asphyxia due to blunt chest trauma: a case report and literature review. J Med Case Rep 2012;6:257. Eken C, Yıgıt O. Traumatic asphyxia: a rare syndrome in trauma patients. Int J Emerg Med 2009;2(4):255-256. Karamustafaoglu YA, Yavasman I, Tiryaki S, Yoruk Y. Traumatic asphyxia. Int J Emerg Med 2010;3(4):379-380. Byard RW, Wick R, Simpson E, Gilbert JD. The pathological features and circumstances of death of lethal crush/traumatic asphyxia in adults–a 25-year study. Forensic Sci Int 2006 Jun;159(2-3):200-205. Newquist MJ, Sobel RM. Traumatic asphyxia: an indicator of significant pulmonary injury. Am J Emerg Med 1990 May;8(3):212-215. Richards EC, Wallis ND. Asphyxiation: a review. Trauma 2005;7:37-45 . Nishiyama T, Hanaoka K. A traumatic asphyxia in a child. Can J Anaesth 2000 Nov;47(11):1099-1102. Byard RW. Pathological changes in the thyroid gland in crush asphyxia. Forensic Sci Med Pathol 2013 Dec;9(4):568-572. Uzkeser M, Aydin Y, Emet M, Cakir Z, Aslan S, Ozturk G, et al. Traumatic asphyxia: case report. Hong Kong JEmerg Med. 2011;18:339-342.Neurosurg 1997 Dec;87(6):843-850.